C.S.I.R. International Convention and Exhibition Venue. Pretoria, Gauteng. Pretoria has its own internationally acclaimed 4 star venue! The CSIR Pretoria International Convention and Exhibition Centre provides flexibility, service excellence and professionalism. 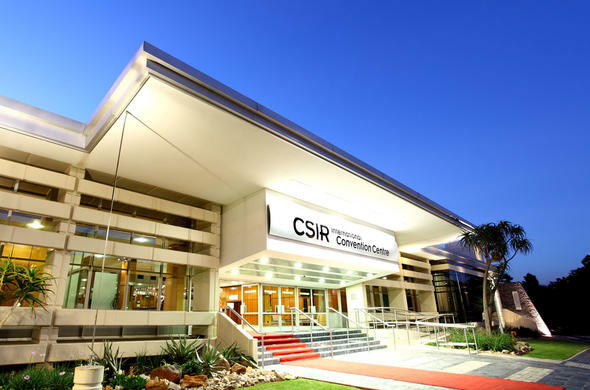 The CSIR Pretoria Conference Centre, situated close to central amenities, is easily accessible from all major routes in Gauteng and very competitively priced. The Centre is often the venue for many types of special and extraordinary events - the sky is the limit. The Centre's auditoriums, conference, breakaway and function rooms cater for groups of between 10 and 450 people. 700 Delegates can be accommodated in parallel sessions and up to 1 000 guests can be accommodated for cocktail-style events. The two larger auditoriums at this Pretoria / Tshwane Conference Centre have schoolroom style seating with raked floors, podiums, soundproof interpreting and press booths as well as digital congress network units between each two seats.Seating and set-up in the other conference and function venues is flexible and provided according to client requirements. Reception, registration and refreshment facilities with adjacent exhibition space are provided in the foyers outside each venue entrance.Not only does the CSIR Pretoria Conference Centre provide the perfect venue, it retains a highly experienced team that will conceptualise and arrange special events and services to make any event a success. The dedicated team of chefs at the Centre offer great menus with distinctive flair. Religious and medical dietary requirements are catered for with ease. The Centre prides itself on its ability to adapt to individual needs.The CSIR Conference Centre has an excellent track record and has been the chosen location for over 500 diverse workshops, meetings, conferences, congresses, conventions and exhibitions with accompanying functions each year.Some of these include the Africa Conference on Elections, Democracy and Governance; the TRC Hearings; the Simmentaler World Congress; WSSD: Science at the Summit; the Bionet International Global Congress and the Seventh International Fiqh Conference, which included Halaal catering for 500 delegates. Essential equipment is included in standard packages and venue hire, with additional equipment available on request. An extensive range of state-of-the-art audio-visual equipment is available at the Centre and video-conferencing equipment can be supplied.The infrastructure near CSIR Pretoria supports all other communication systems such as satellite links and specialized power requirements. All the Centre's equipment and facilities are constantly upgraded to ensure they meet international standards. Venue Styles and Capacities contd. CSIR Pretoria offers a range of Conference Packages, which include catering, facilities and equipment, as well as venue-only packages. The Centre also provides a wide range of function menus (i.e. cocktail menus, buffet menus, plated menus, barbeque menus, etc.). Personalised and custom structured packages and menus are available on request. Venue preparation; catering services; audio-visual equipment supply and support; first aid; glass-fronted soundproof translation and press booths; full business centre services; cleaning services; security services; on site medical centre and facilities for the disabled. There is sufficient secure free parking for up to 500 vehicles. Banking facilities; travel desks and bureau de change; decoration service; electricians; print shop; graphic design; musicians; photographers; stenographers; translators; venue organisation; stand construction and a forwarding agents. Recreational facilities such as beach volleyball, swimming pools, a soccer field, and squash and tennis courts, are available by prior arrangement.